Sometimes I think you have a better chance of spotting a unicorn than you do some vintage Hamilton models. There are quite a few models that were extremely expensive back in their day - so very few people could afford them. The reason other models are so scarce is a bit of a mystery - maybe they just weren't popular. Regardless, there are quite a few fairly ordinary watches that you just don't tend to see. 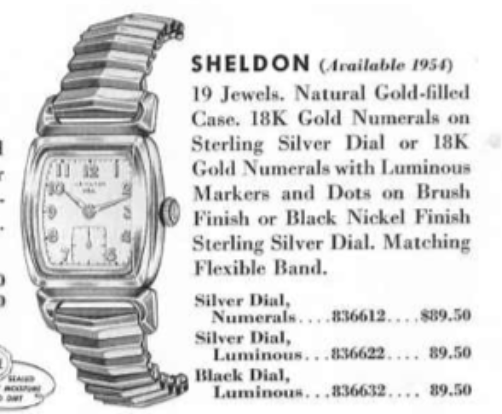 A good example is the 1953 Sheldon. It was part of the CLD ("sealed") line of watches that incorporated a series of gaskets to seal them from the environment. The CLD line predated the "waterproof" models introduced later in the 1950's. They weren't waterproof, just "sealed from the environment". Anyway... you never, ever, see Sheldons in the wild. The Sheldon came in a 10K gold filled case with your choice of an all numeral AGN sterling silver dial or, starting in 1954, an applied gold numeral / marker dial. If the model looks familiar, it's probably because it looks a lot like the 1948 Brandon - which was discontinued in 1951. Like the Brandon, the Sheldon has a two piece case. When the bezel is popped of, the movement can be pulled out the front, thanks to a two-piece stem. Inside the Sheldon you will find Hamilton's 12/0 size 753 movement with 19 jewels. This movement would be replaced in 1955 by the 22 jewel 770 movement so you might find a 770 inside if you ever come across a 1955 Sheldon. When I first started collecting Hamiltons I was quickly drawn to the CLD line. The early CLD's like the Nordon, Langdon, Brandon and Steeldon are fairly common. They're very solidly built too - so they're often in good shape when you find them. I thought that maybe I'd develop a nice collection of all of the CLD models - but then I realized that quite a few of them are solid gold and the later versions are extremely hard to find. So I threw in the towel on CLD's and cast a much broader net. One of my collecting friends as the CLD bug much worse than I did - and he recently came across a Sheldon in a local shop. It's the first either one of us has seen in the flesh. It wasn't running so he sent it to me for some TLC. As received, it was in very nice shape - some typical bumps and bruises but no serious wear through to the gold filled case. The bezel, in particular, can be very prone to wear on the corners. One of the reasons for the lack of wear is the crystal stands proud of the bezel and that protects the entire watch from being worn through by long sleeves, etc. The 753 is in surprisingly clean shape - I'm not sure why it's not running but it could just be caused by the oil inside turning to gel and stopping the power of the mainspring from going through the gears. I'm optimistic that just a thorough cleaning will do the trick. The 753 is virtually identical to the 770 with the exception of the extra 3 cap jewels employed on the 770 to bring the jewel count to 22. Most of the internal parts are interchangeable. Everything is completely taken apart and cleaned before being reassembled with fresh lubricants. Right out of the chute the watch is running very nicely. The beat error of 2.3 is on the higher side of acceptable. Adjusting the beat error on a watch like this is very tricky business and requires several attempts to get it any closer. Each attempt is pressing your luck, in my opinion, so like most things in watch repair - you need to know when to stop. The movement, dial and hands all go back into the case, along with the reflector ring before the bezel is snapped back on. I think the Sheldon is a close cousin to the Brandon - they are very similar - perhaps that's why the Sheldon is so uncommon. It's a nice looking watch though and I'm sure my friend will enjoy giving this watch it's rightful place in his very nice CLD collection. Here's a quick before and after of the luminous version of the Sheldon, complete with it's original Kreisler bracelet. The only disappointment with the after photo is the small cracks that appeared in the lower corners of the crystal when I reinstalled the bezel. It's a very tight fit with the crystal and reflector ring inside and apparently there was too much stress inside. Grrr..! Comes with the territory though. Handy Dan, sorry to post this here, but we couldn't get the link to ask a question to work with our computer. we have my husband's grandfather's Hamilton Pocket watch that he used when he worked for the railroad around 1909 or so. We can't find any information on it. It is about 2 1/4" in diameter gold tone case. We have unscrewed the glass cover and on the rim is a number 1574647. We don't know how many jewels as we aren't sure how to take the back off. could you give us an idea of value or where we could get a value? our email is indianajones47@comcast.net.